bro, now I am doing some extreme stunt. 2 months later I invite you come take pic and update. Last edited by williamt; 26-09-2005 at 06:23 PM. Bro Kage, this is what you mention in the 1st page : Appetite Loss - This again has to do with the way the users acclimatise their reds to the tanning regime...if suddenly intensified lights are shone at them, weak-hearted reds will display stress and lose their appetite altogether. If let say during the 3hrs interval does it mean on and off every 3hrs? If appetite loss, does it mean to stop everthing? Or just leave it until it adapt to it then start to feed again? Last edited by krowana; 26-09-2005 at 07:38 PM. I brought this old thread out for discussion. Of course there are other classes of chromatophores but this 3 would be our main area of interest. By tanning with UV <380nm, we would expect melanophores pigments dispersion thus darkening of the fish. 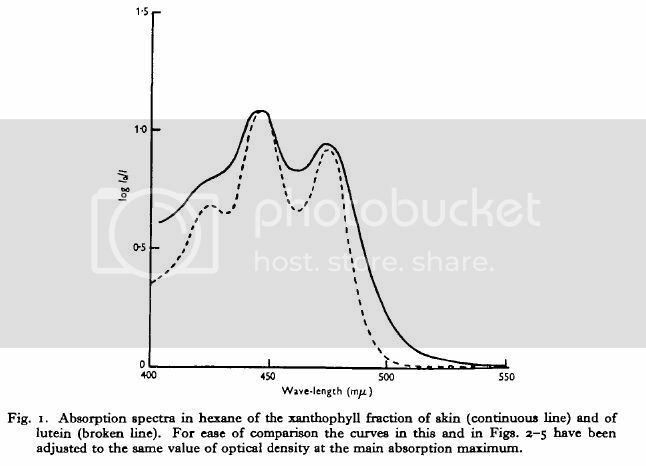 Here's the spectra absorption chart for xanthophores(yellow) pigments. There is an absorption peak at the 450nm and 475nm. Assuming that we want to bring out the max effectiveness of bringing out the yellow/gold color, we should be tanning the fish with a light source that is peaking between 450-475nm. However, if we were to tan solely with a monochromatic light with a very narrow wavelength at 450-475nm. The fish would appear dark/black as most of the light is being absorbed and not reflected. While this would make a very good tanning light, it would not be a good viewing light as it does not reflect the yellow/gold color we want to see. Take a look at the spectrum chart of the various bulbs produced by ushio. If we were to tan the fish using a 20000K bulb, the tanning effect would be at its maximum but viewing at its worst as there is not enough yellow ~580nm light to be reflected back into our eyes causing the fish to look black. The ideal tanning light would be one that peaks at the max spectra absorption 450-475nm and at the same time peaks at the yellow spectrum. Which in this case would be the 14000K bulb as it gives out less UV (<380nm) thus reducing melanophores activity. I personally feel that tanning with UV while will also bring out the other color pigments(spectra absorption is not an absolute value but a range with max absorption at a certain wavelength), melanophores(black) would be at its max absorption. With black as its dominant color, it would overshadow other color pigments. This might also explain why NAN lights(mainly red spectrum) makes the fish look so red(reflect red light back to our eyes) but does very little for the actual tanning of fish.